an easy lamb's lettuce stir-fry. Corn salad, Lewiston cornsalad, lamb's lettuce, lamb's tongue, fetticus, field salad, mâche, feldsalat, nut lettuce and rapunzel. I bought it at a vegetable stall at the market where it was labelled as "corn salad", which had me imagining them to be young corn sprouts. But no, apparently this little vegetable used to be harvested from corn fields before the days of commercial cultivation, and that's where it got its name. I've taken a liking to the name "lamb's lettuce", though, because this was charmingly derived from its resemblance to a lamb's tongue, and also because it is purportedly a lamb's favourite food. So from here onwards I'll be referring to it as lamb's lettuce. lamb's lettuce, aka corn salad, lamb's tongue, fetticus, field salad, mâche, feldsalat, nut lettuce, rapunzel. To me, lamb's lettuce tastes like a marriage of butter lettuce and baby spinach. It's quite mild when raw, and features often in salads, but I personally think that cooking actually brings out more of the sweetness of the vegetable, even if they do shrink a lot in the heat. Lamb's lettuce cooks fast, too, so you can add it into a soup right at the end, and when stir-fried, as I have done, you shouldn't need more than 20 seconds, and perhaps even less, depending on whether you want to retain a little bit of crunch or if you prefer them completely tender. So keep an eye out for this little vegetable next time you're at the markets. Or jostle with some lambs for a share when you're next strolling through a corn field. Thoroughly wash lamb's lettuce, as dirt collects easily in its nooks and crannies. Trim off the roots, if you like - I didn't bother as they were quite tiny. Shake off as much excess water as possible, or use a salad spinner to do the job. Heat up the oil in a frying pan or wok over a medium heat, and swirl it around. Fry garlic and chilli for about 20 seconds or until softened. Turn the heat up and add lamb's lettuce. Stir-fry for another 20 seconds or until slightly wilted, bearing in mind that they will continue to cook from the residual warmth of the pan. Remove from heat immediately. Mix in soy sauce and sesame oil. Serve. This stir-fry recipe can be adapted to suit other vegetables in lieu of lamb's lettuce. To make this dish gluten-free, use a wheat-free soy sauce. I believe this green is often incorporated into prepackaged salad mixes in the stores around here, but I'm not sure if I've seen it for sale individually. I'll definitely keep an eye out for it when I next find myself in a field! I think 'fetticus' is the worst of its given names. Sounds blegh-y. Very cute! :D Yes, it doesn't seem to be very common. I got mine from a market vegetable stall which is proving to be a treasure trove of unusual goods. Lamb's lettuce is such a sweet name, that's the one I think I'd stick with too. Love how versatile it sounds. Such an adorable name, isn't it? The mildness certainly makes it pretty versatile. 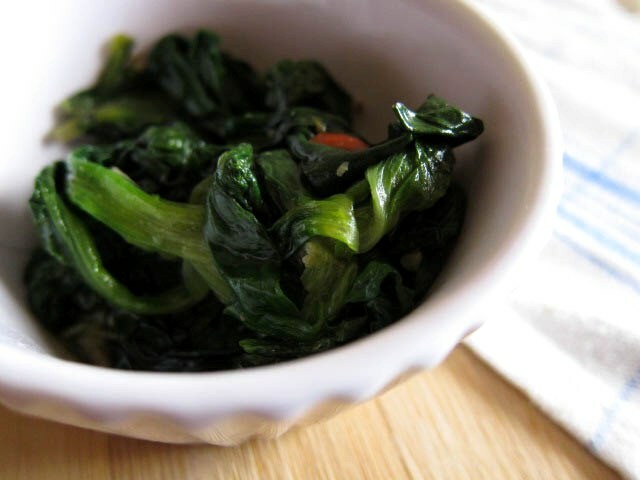 It doesn't taste significantly different to other greens, but it's a lovely addition to the repertoire, for sure! Hew wow, I had no idea mache and lamb's lettuce were the same thing! You, my dear, have Taught Me Good. This green which is called bakleh here, is very popular and grows in every vegetable garden like a weed; it is used in fattoush salads and other salads, and used to stuff dumplings to be baked. Delicious! I just used it today to make a bean salad. Nutritious too I am told. Thanks for the additional information! I don't think I'd mind this growing weed-like in my garden. Liking the sound of using them in baked dumplings, too. 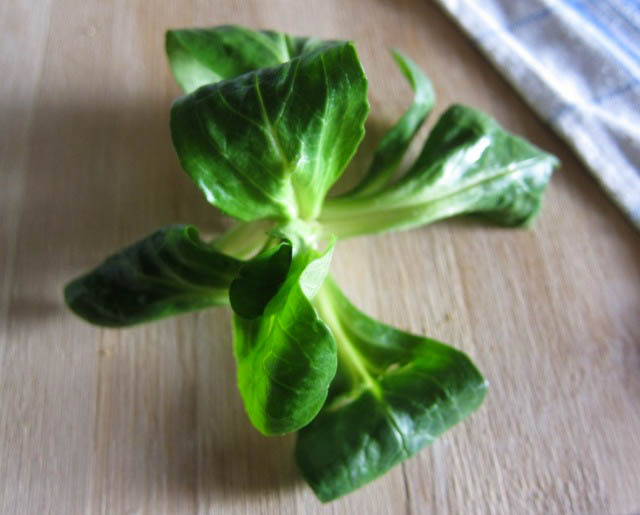 A fab introduction to lamb's lettuce, Leaf. I haven't come across this little fella - will keep my eyes open from now on, though. Lovely post. Thanks for sharing. Well that might just be the vegetable with the longest list of fun names ever! I had it on a dish in a restaurant last week and they called it mache. Lambs lettuce sounds very sweet. 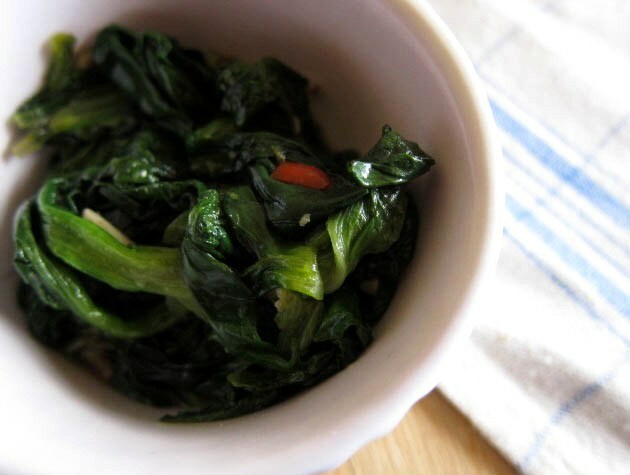 I love greens that are stir fried like this... always reminds me of the big platters of garlic and chili stir fried greens I ate in Vietnam. YUM! It seems mache is one of the more commonly used names. You can submit your lamb lettuce stir fry pics on my Food Photography site. It is a food (and drink of course) photography site where members can submit all food (and drink of course (again) LOL ) pictures that make readers hungry. I didn't want to use the lamb lettuce in a salad or soup so I gained inspiration from your recipe and fried some onion, garlic, green chillies and potatoes, added some peppers and tomatoes, seasoned with soy sauce and dried herbs and finally added the lamb lettuce. Served it with millet groats and it turned out great.